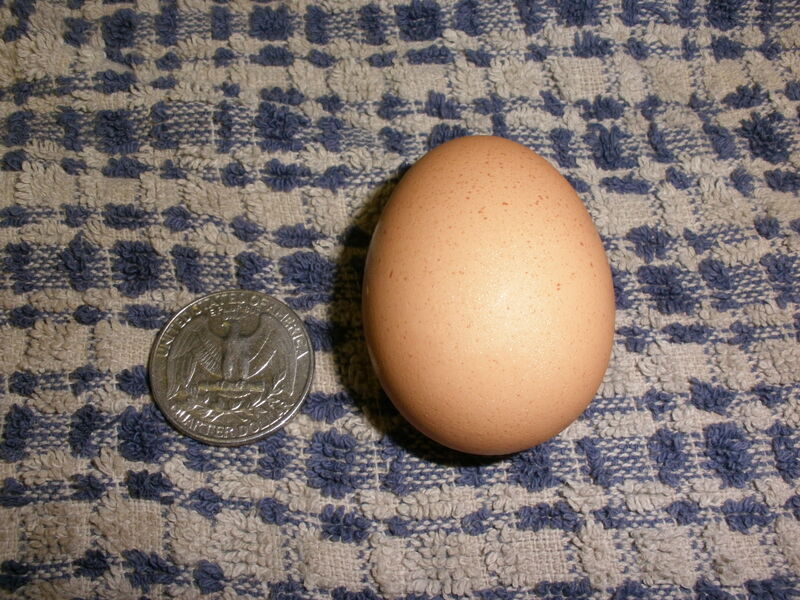 Luna's First Egg next to the Mystery Egg for size comparison. 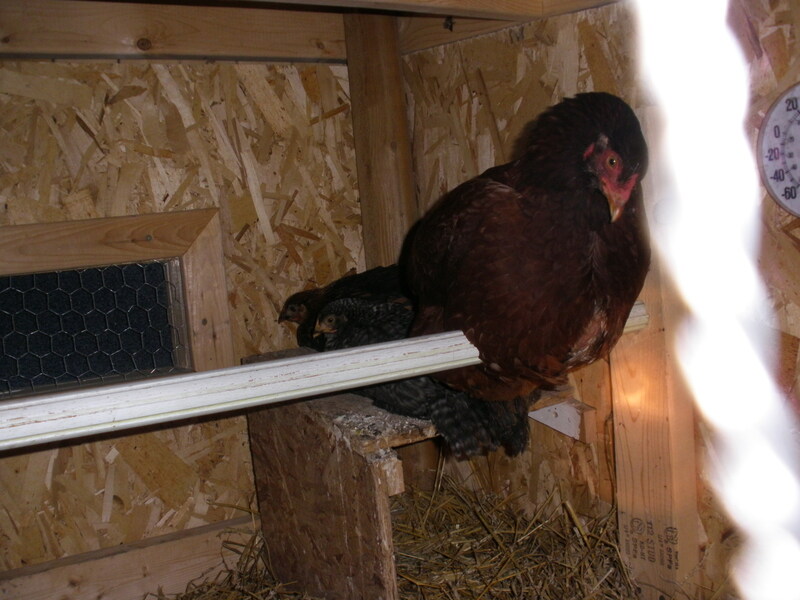 See, I knew she didn’t lay that brown Mystery Egg. They are so good so good you see! So I will eat them in a box. 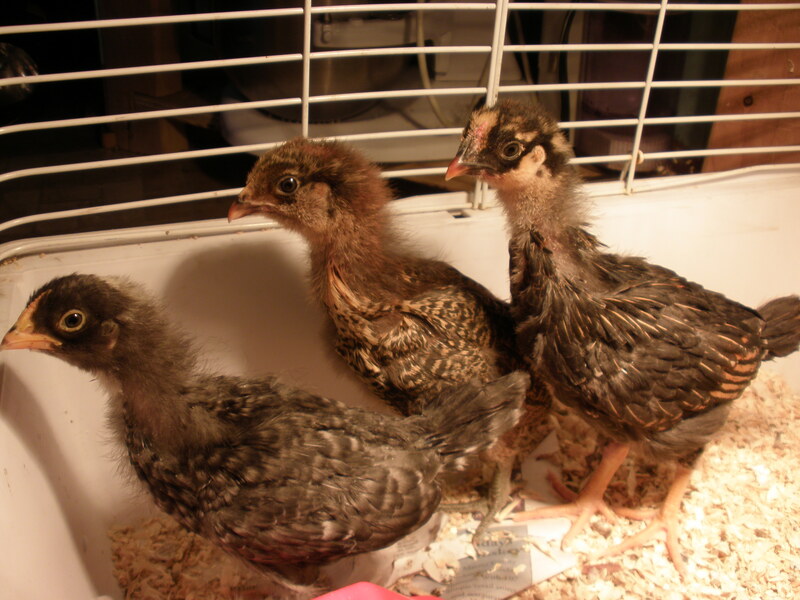 It’s been awhile since I did a chick post, so when I saw this post at Grow & Resist and then this post at Traverse City Urban Chickens I decided it was time to show you some more pictures of my little ladies. It seems like only yesterday they were little, fuzzy fluffballs. Remember these little cuties? Starting at top left and moving clockwise you can see our Dominque, Bella; Luna, the Easter-Egger and Hermione, the Golden-Laced Wyandotte. They change so quickly I wish I would have taken more pictures but you’ll have to settle for my sporadic time-lapsed photography. Here on Easter Sunday, the girls were six days old. You can just see their wing feathers starting to develop. Top left is Hermione, Bellatrix is in the center and Looney Luna is along the right side. 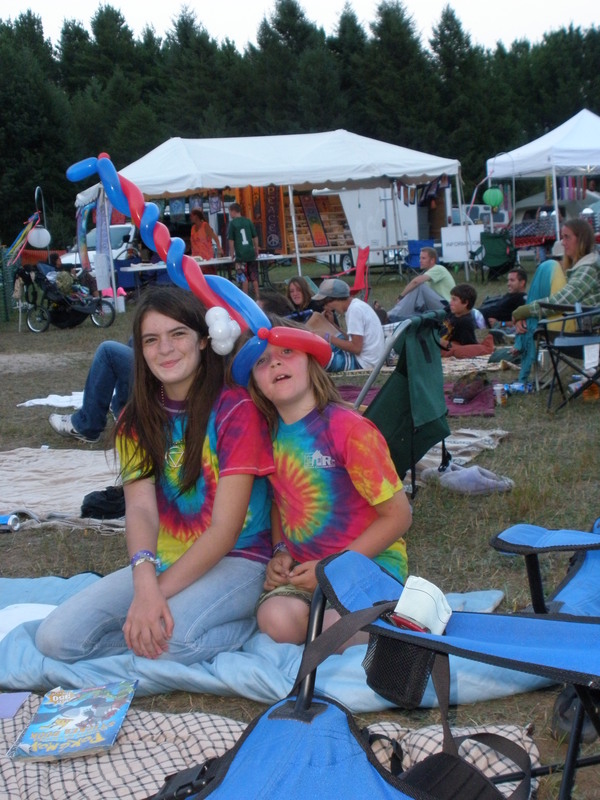 The girls at 17 days perched on Mr. Hippie (who was playing camera-shy). Hermione wouldn’t stay turned-around but at least from this view you can see her tail feathers. Luna is center and Bella on the right. You can see their feathers starting to come in but they still have a lot of downy fluff. The girls at twenty days. Don’t they look strange? Their bodies are mostly feathered, but their heads are all fluff. It makes their necks look extra spindly. Luna (in the center) is way ahead of the other girls in feather development. 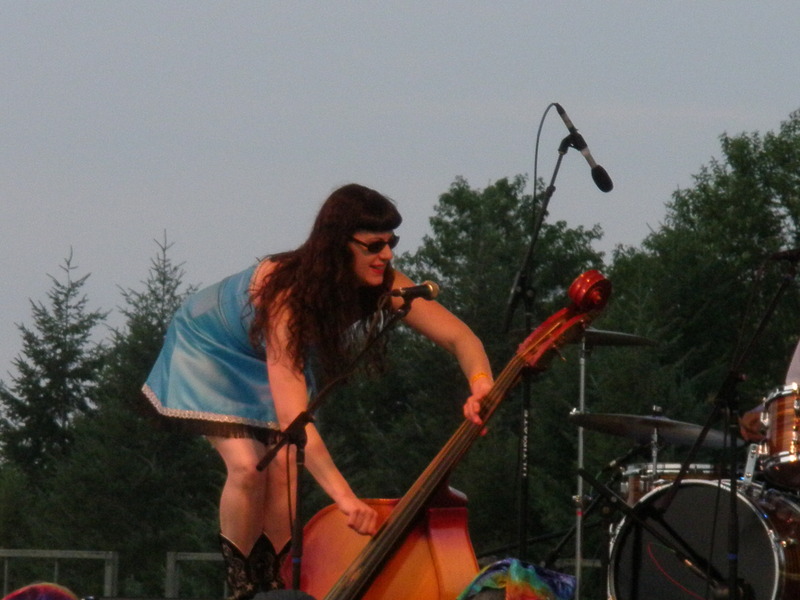 She reminds me alternately of a hawk and a road runner. 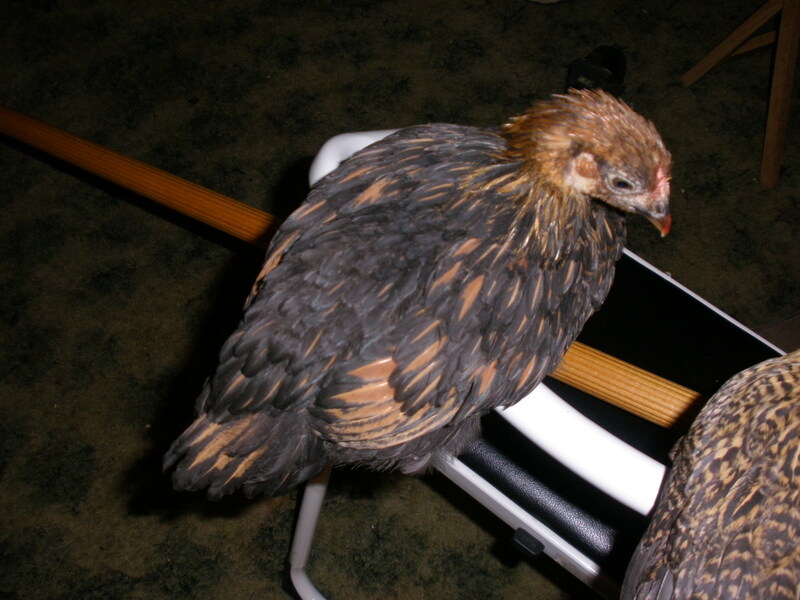 Bella (on the left) is still my favorite, but I think once Hermione’s feathers come in she is going to be beautifully marked. She is the most skittish of the three. 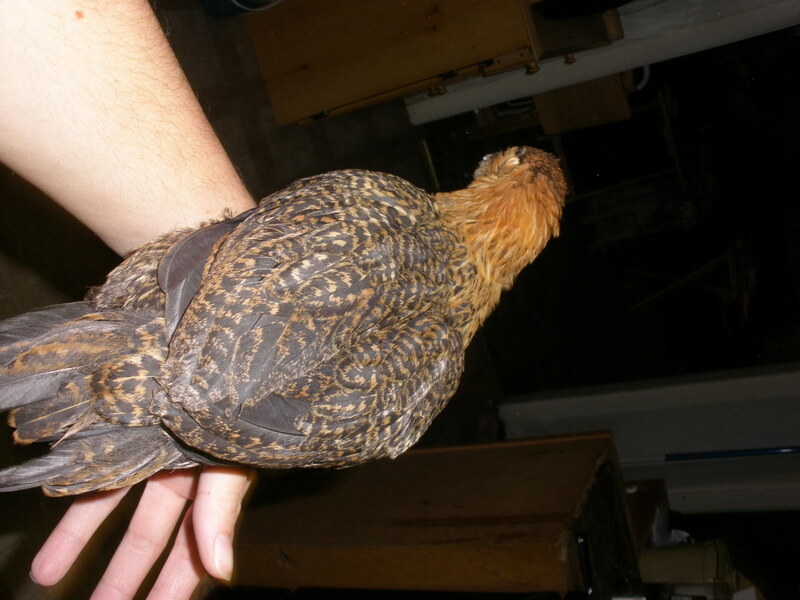 If I put my hand into the brooder, Hermione runs into a corner, Luna mostly ignores me and Bella jumps right into my hand. All three will tolerate being held once they are caught, but Bella seems to want to be held. 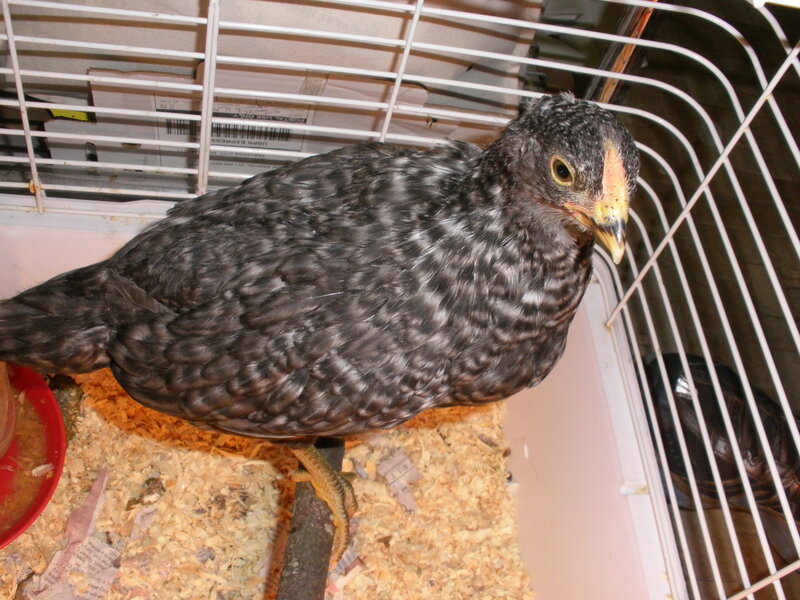 Luna is the most confident and tries to escape the brooder to explore if the lid is left open. 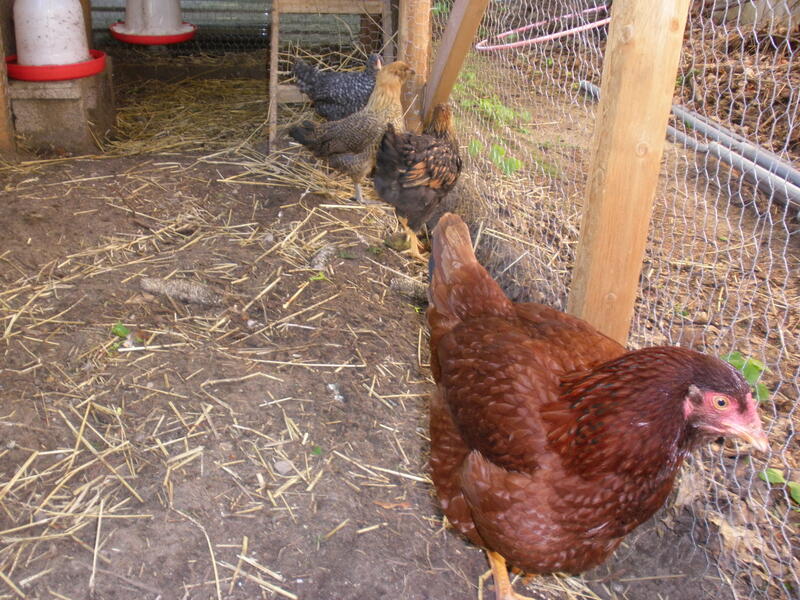 The kids and I put them into the chicken run to introduce them to Molly yesterday. It went ok. Not well, but ok. They all just stood there. Nobody moved. And then. . . Molly started pecking at the chicks to see what was going on with them. 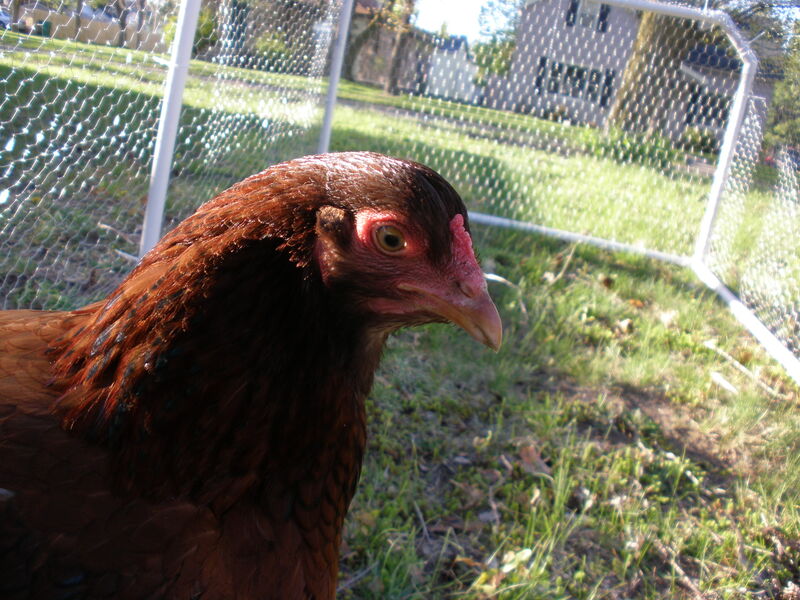 Once both Luna and Hermione had been pecked once I decided it was time to go back inside. We’ll try again soon. But, ever since the demise of the roosters, I’ve been waiting for the day we could have chicks. That day is today! 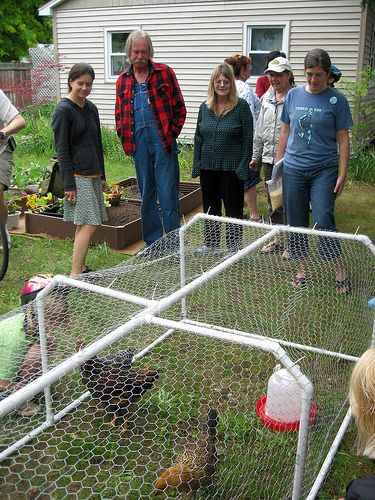 Tony over at Traverse City Urban Chickens coordinated the chick order for us. We placed the order a long time ago but because of the numbers and varieties of chicks we selected, we had to wait until now for the “stars to align”. Our chicks hatched yesterday and arrived this morning. Nine little girls in a box. The box the babes popped out of. The little box is so cute. Tony let me take it to transport my three girls home from his house. He has pictures of all the girls in the box and of the girls shortly after their arrival here. 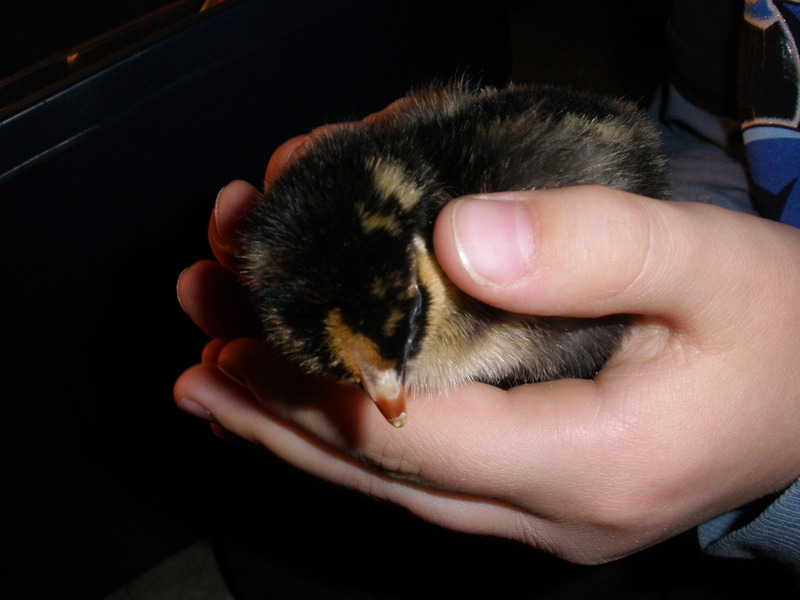 He also has an amazing brooder that I’m sure he’ll share some pictures of when he gets a minute. 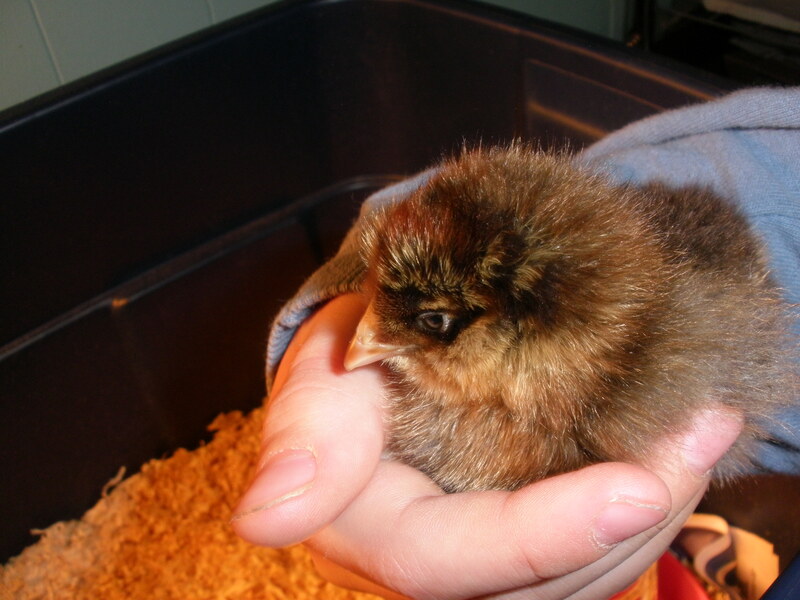 We’re reusing the guinea pig cage brooder that we used for our first four chicks, but I gotta tell ya, day-old-chicks are so much cuter than month-old-chicks. They like to stand in the food to eat but the chick feeder is way too big right now. 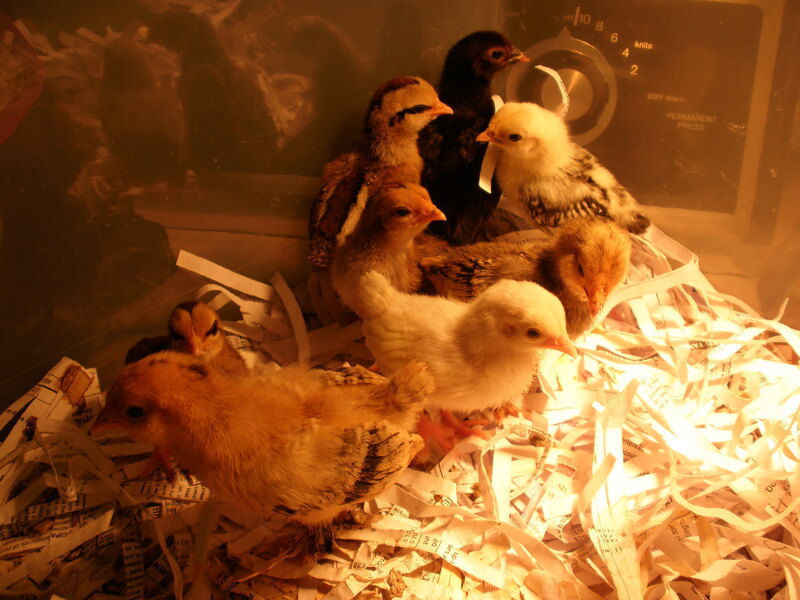 Our day-old chicks are already as big as Steph’s banty chicks but they are all fluff. It will take a while for their feathers to come in. 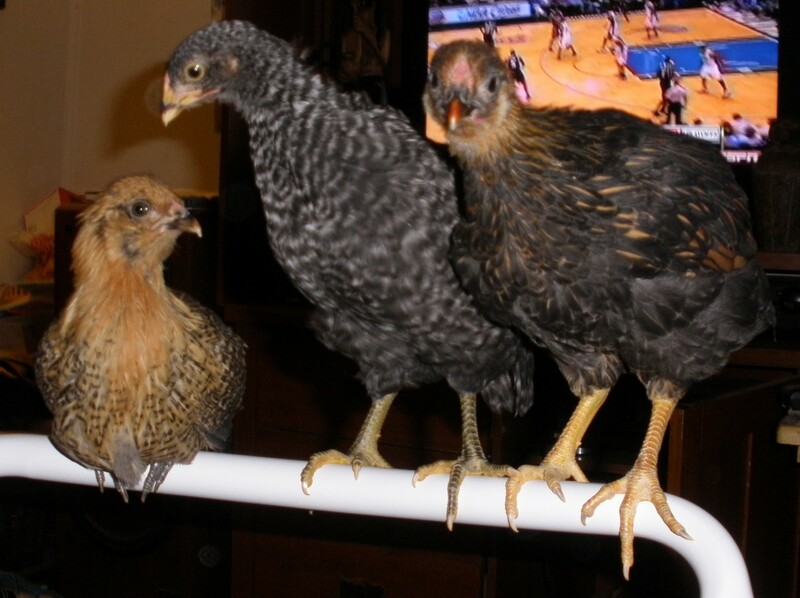 I’ll post pictures regularly, but don’t count on daily a la “Three Chicks a Day“; that’s been done already. However, these girls are different varieties so the pics’ll be different even if I did opt to follow in Josh Elliot’s footsteps. 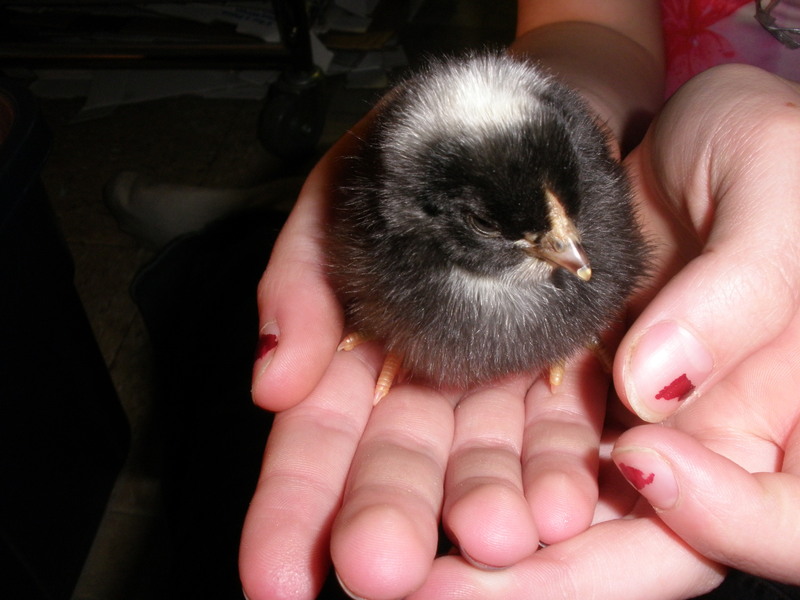 When I ordered my chicks I chose them based on the characteristics of the adults. I had forgotten what the chicks looked like and was surprised at how dark my little ladies are. 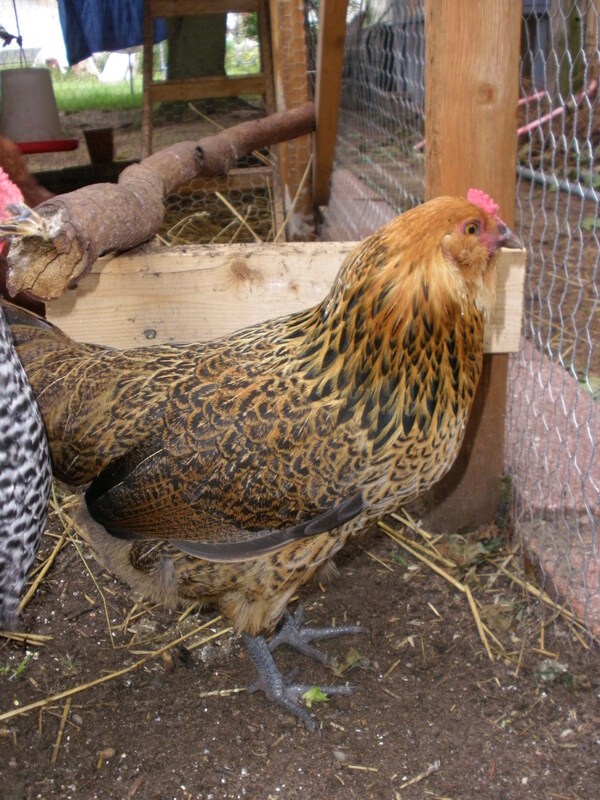 This is Hermione, a Golden-Laced Wyandotte. Here's Luna Lovegood. 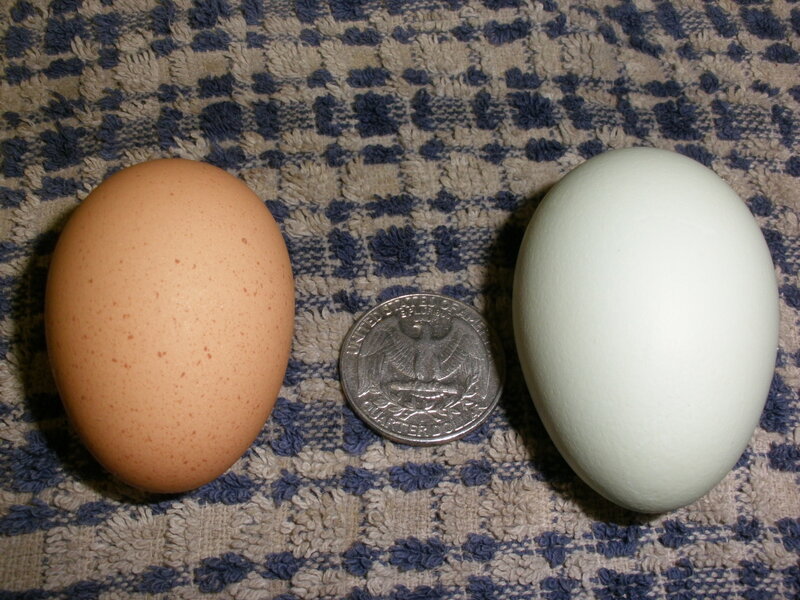 I named her that because she'll lay "Loony" blue, green or pink eggs. Bellatrix LeStrange. I hope she isn't evil like her namesake but she'll be black and white. And, that is why I had to rename Chicken Cacciatore. After we culled the roosters from our flock I started calling her Ginny for Ginny Weasley because she’s a Rhode Island Red. 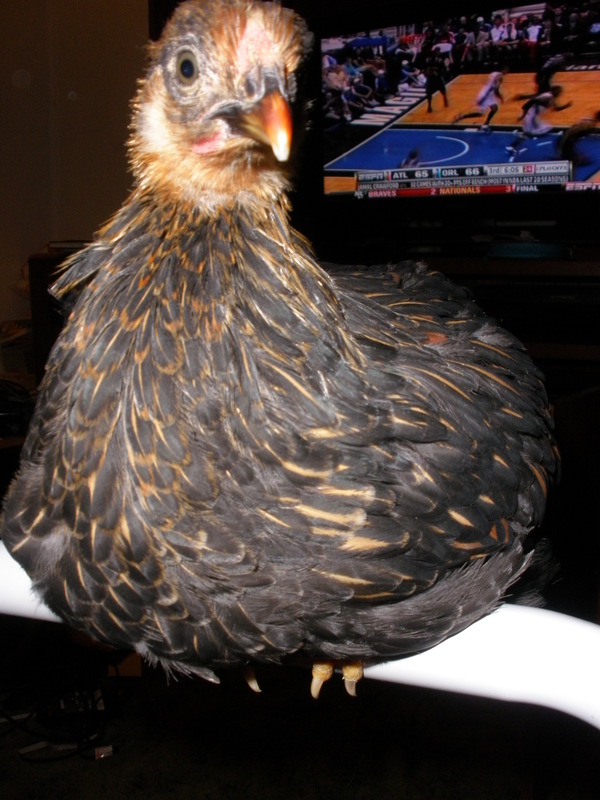 But then I decided that since she’s much older than all my new girls she should have a more mature name. 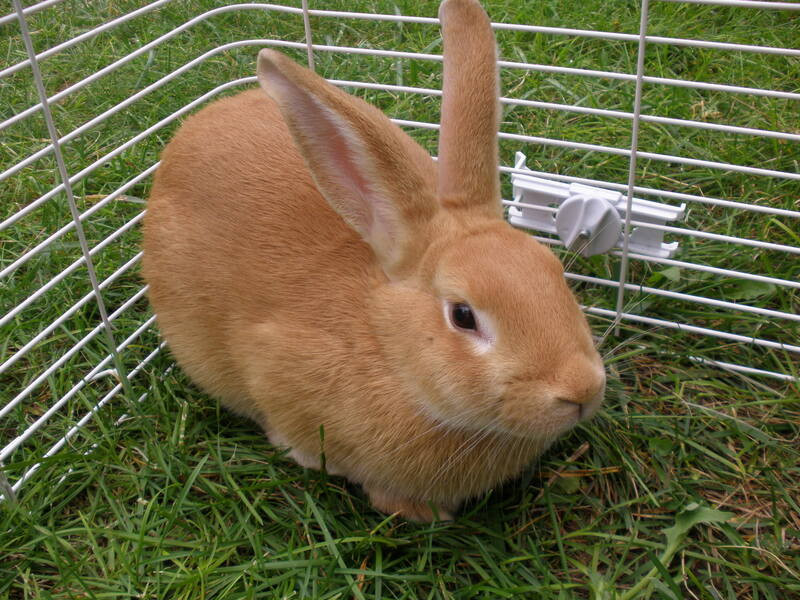 So, her permanent name is Molly Weasley after the matriarch of the Weasley clan. 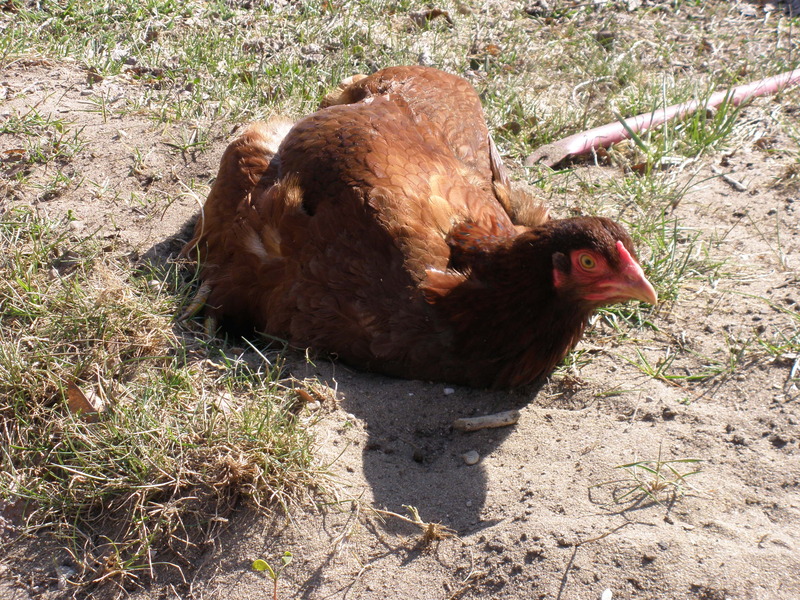 Molly loves a dust bath. 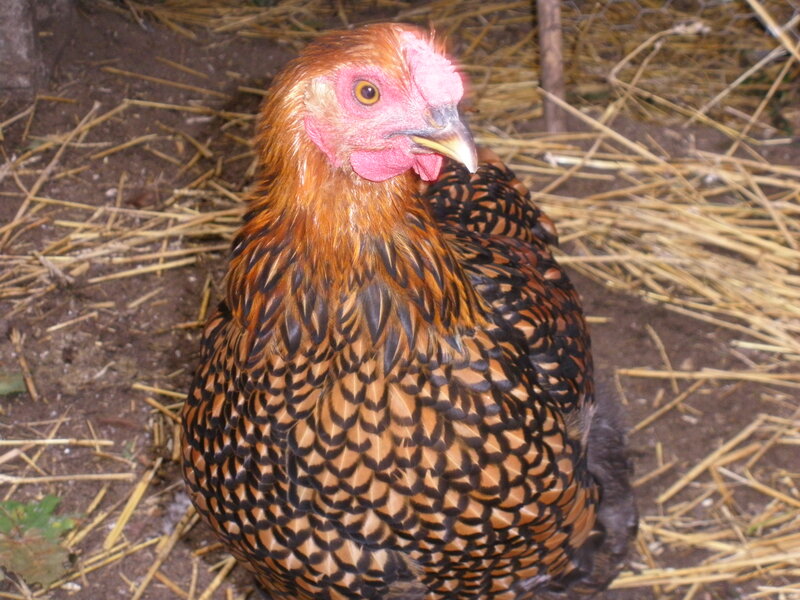 I’ll introduce the girls to Molly when they’re a little bit older but for now they’re safe in their brooder. 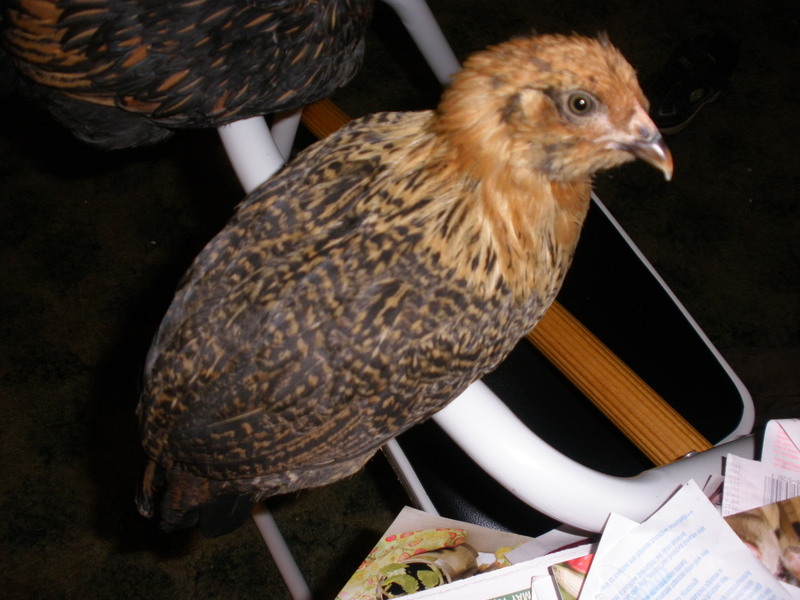 If you’ve been following my chicken saga, you are by now well aware that three-quarters of my flock turned out to be of the illegal crowing variety. So, now what?? Well, the roos have to go. There are, I suppose, several options. I could try to sell them. I could give them away on Craig’s List or Frecycle, or maybe even take them to the humane society. Or, I could butcher them. Butchering was always our plan. From the very beginning, the children were told that if any of the chicks were roosters, they would be dinner. 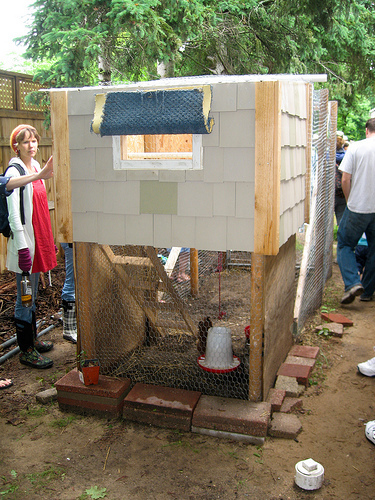 And, that when the hens stopped producing, they would have to go too. Mr. Hippie was researching guillotines months ago when we first started thinking one or more of them might be roosters. He never got as far as actually building a chicken guillotine, but he was pretty intent on building one for a while. However, the city ordinance that allows four hens and bans roosters also prohibits the (outdoor) slaughter of chickens in town. So, I put in a call to Olds’ Farm. I get a lot of poultry from them and have purchased everything from their maple syrup to their ground beef. 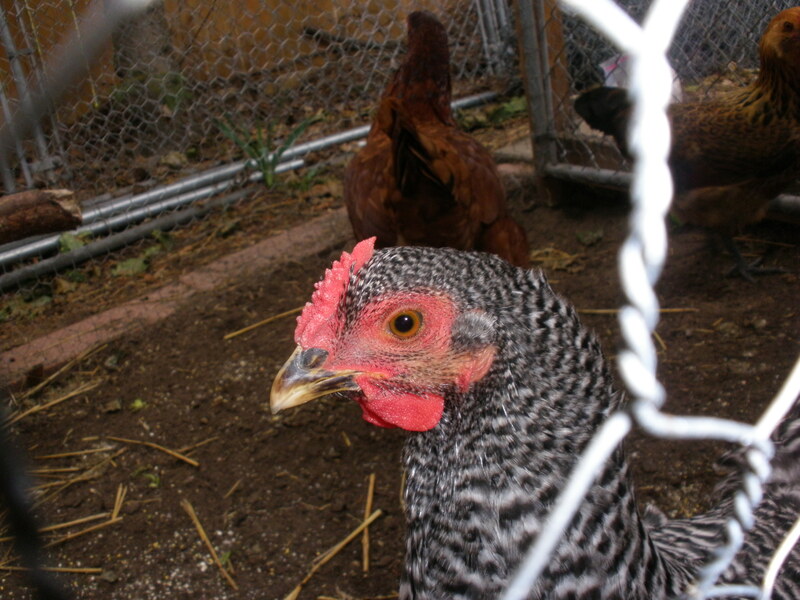 In addition to produce and ethically-raised meats, Olds Farm also offers poultry processing. I’ve got a call in to them to have my roos butchered. As soon as they get enough birds scheduled, they’ll call me back to let me know the drop-off date for my three. It’s sad, but I’ve come to grips with the omnivore’s dilemma. I’ve arrived at a place that every conscious omnivore must reach. If I can’t raise and eat my own birds, why is it okay for me to march into the grocery store and buy an already slaughtered chicken? If I can’t eat those three roosters, I don’t feel justified consuming meat. Granted, there is still a separation between me and the actual slaughtering of the birds. I’m not quite There yet, but I think I will be eventually. With every yin there is a yang. When one door closes, another opens. Whichever idiom you choose, good and bad seem to go hand in hand. This time is no different. I may be losing three roosters, but now I have the opportunity to raise chicks. Day. Old. Chicks. 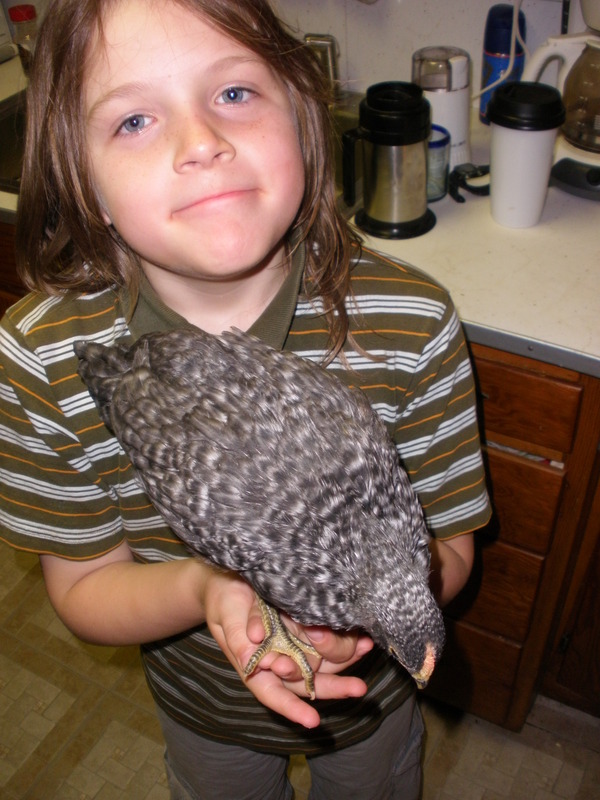 Fellow blogger Tony of TC Bok Bok is ready to start his adventures in urban chicken farming and we’re ordering our chicks together. 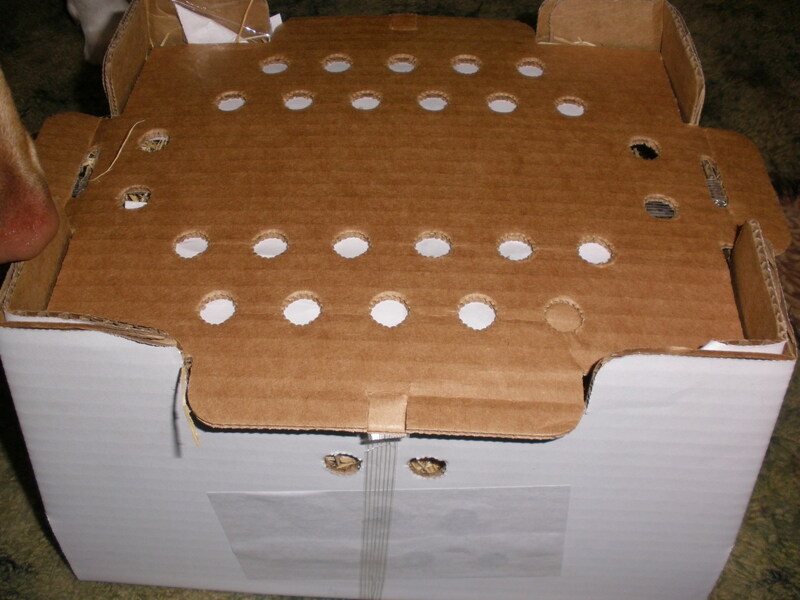 This will mean safer, warmer transport for the young chicks, and shared shipping costs. I’m paying a little more for them than I did for the last “girls”, but the chicks from My Pet Chicken are guranteed to be girls so as Tony says, the extra cost is hen “insurance”. 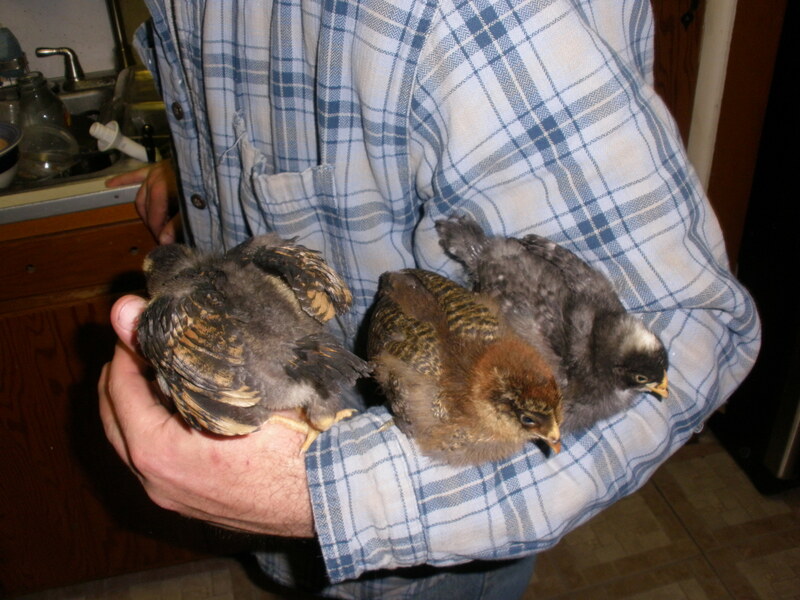 Plus I got to pick the varieties of chicks that I wanted! 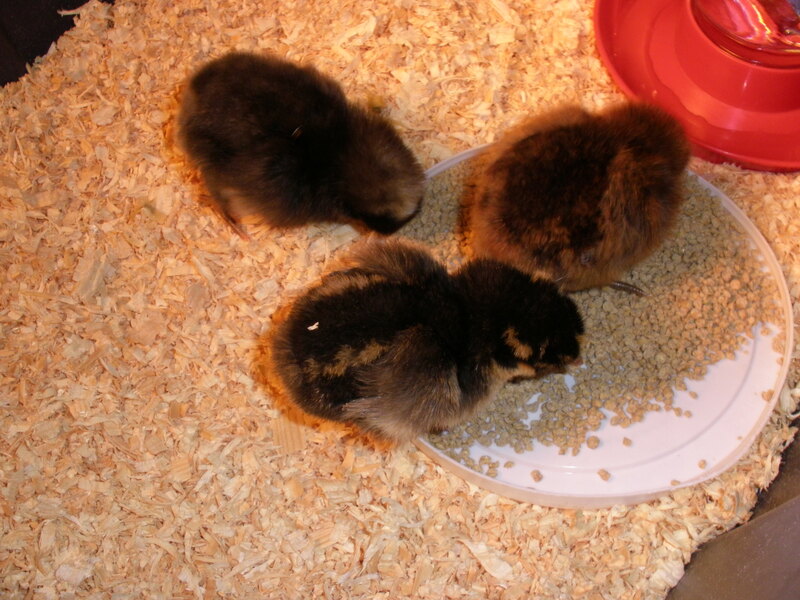 The order is in and I’m getting three chicks the last week of March. 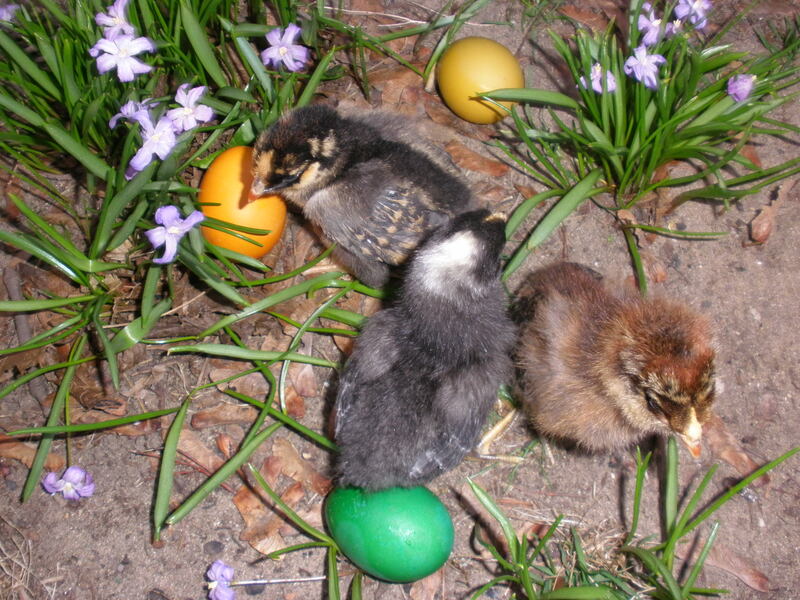 An Easter-Egger, a Dominique and a golden-laced Wyandotte are on their way to keep my soon-to-be lonely Rhode Island Red hen company. I can’t wait to meet them!